The General Meeting: The evening General Meeting is held in the Community Room of Fire Station 14, close to the intersection of Academy Blvd. and Dublin Blvd (1875 Dublin Blvd). Parking is free! The General Meeting is held on the second Monday of every month. See the Calendar for all the dates and topics. Take I-25 to the Woodmen Exit (#149), and head east on Woodmen Rd. In about 100 feet, take the first right behind Hanson's Spas and Superior Auto. Drive 200 feet up the curvy drive way, Fire Station 14 is on your left. See photo below for parking. From I-25 to Fire Station 14 - near Academy and Dublin. Zoom in (+) on Google map. Parking at Fire Station 14. 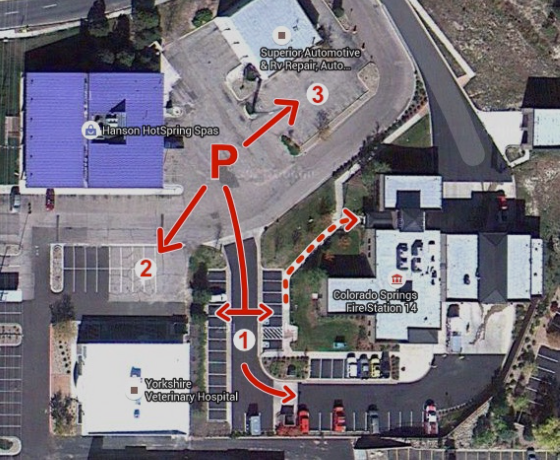 Follow dashed line to the building entrance. SMMUG General Meeting is FREE and open to the public. FREE Wi-Fi at both, General and SIG locations. 7:00 Main program. The main program varies from month to month. Check our announcement to the right to see what the program will be at the next meeting, and our Calendar for topics. Saturday SIG (Special Interest Group) Meeting: The SIG Saturday meeting is held at City Mac at 5020 N. Nevada Ave. The SIG is held the second Saturday of each month. They run from 10:00 am till 12 Noon. See our online Calendar for more details on the SIGs. Take I-25 to Exit 146, Garden of the Gods Rd., and exit heading east on Garden of the Gods Rd. Stay in the left lane. 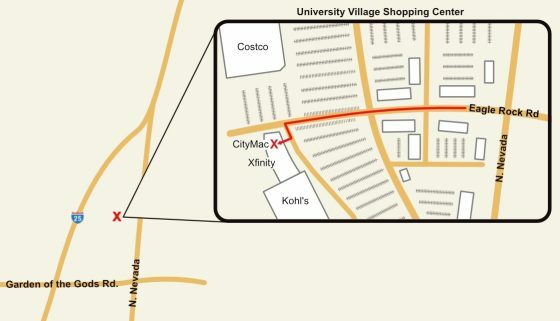 At the 2nd light, before you head up the hill, turn left (north) onto Nevada Ave.
At the 2nd light, turn left into the University Village Shopping Center (Eagle Rock Road). Drive straight for 500 feet, CityMac is on your left, across from Costco.